United States Environmental Protection Agency (U.S. EPA) / Asbestos Hazard Emergency Response Act (AHERA) "Guidance for Controlling Asbestos Containing Material in Buildings" (EPA 560 / 6-85-024, June 1985) National Emission Standards for Hazardous Air Pollutants - Asbestos Demolition, Renovation and Waste Disposal; 40 CFR 61, Subpart M.
The Occupational Safety and Health Administration (OSHA) - Safety and Health Standards for the Construction Industry 29 CFR part 1926.62, Subpart D. Ohio Administrative Code (OAC) Chapter 3745-20, Asbestos Emission Control. Conducting a visual site survey to determine potential ACM and to define homogenous areas. Determining an accurate number of bulk samples to be collected based on information obtained from the visual survey. Collecting bulk samples from suspect ACM based on the visual survey. Laboratory Analysis. Black mastic associated with the red/brown 9”x9” floor tile as found on the first floor – 5% Chrysotile and approximately 5,000 SF Window glazing as found on the exterior windows – 2% Chrysotile and approximately 500 linear feet (LF) Thermal system insulation as found on pipe runs within the basement – 15% Amosite and approximately 800 LF Thermal System Insulation (Air Cell) as found on a vertical pipe within the basement – 40% Chrysotile and approximately 5 LF Thermal System Insulation as found on an elbow within the basement – 5% Chrysotile, 10% Amosite and approximately 5 elbows. Thermal System Insulation as found on an elbow within the basement – 10% Chrysotile, 10% Amosite and approximately 5 elbows. For full analytical laboratory data and COC documentation please refer to the Attachment A. Site Photographs are provided as Attachment B. CONCLUSIONS AND RECOMMENDATIONS The results of the pre-demolition asbestos survey indicate that the red/brown 9” x 9” floor tile and associated black mastic throughout the first floor, the window glazing on the exterior windows, and thermal system insulation on pipe runs and elbows throughout the basement were identified with a percentage of asbestos that is >1%. 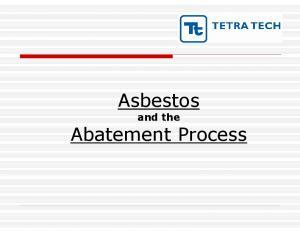 The asbestos containing thermal system insulation is considered regulated asbestos containing material (RACM). Therefore, this material must be removed and properly disposed of by an Ohio Department of Health (ODH) licensed asbestos abatement contractor prior to demolition activities. The estimated cost of the thermal system insulation abatement work is $17.00 per linear foot ($13,685) with an additional $1,500 for the abatement work on the elbows, thus totaling an estimated cost of $15,185. The floor tile and the window glazing is considered Category I non-friable materials and may remain within the building during traditional demolition (bull dozer, excavator, etc). 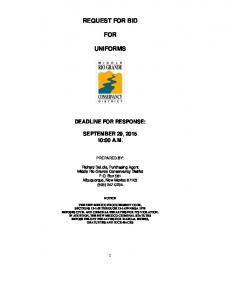 In addition, no special considerations for asbestos disposal need to occur. Please note that if traditional demolition does not occur, and if activities such as chipping, cutting, sawing, grinding, or abrading occur on these materials, Patriot recommends utilizing the services of a licensed asbestos abatement contractor to remove and dispose of these materials prior to demolition. Patriot did not assess the roof of the building and did not sample all of the roofing materials. A sample of the roofing material that was detached from the building was sampled and determined to be non-asbestos containing. The roofing material is considered Category I material that can be left in place during demolition and disposed of as general construction debris. An ODH licensed asbestos abatement contractor must conduct abatement work related to friable materials in accordance with federal and state regulatory requirements. The owner/operator of the building or the demolition contractor must submit a notification to the Ohio EPA and ODH ten business days prior to the start of abatement activities if certain quantity thresholds are exceeded. The ODH abatement notification is required once a total threshold of greater than 50 square feet or 50 linear feet of friable ACM is being removed per project. The EPA notification is required once a total threshold of 160 square feet or 260 linear feet of friable materials are being removed per facility. Based upon the estimated linear footage of TSI, a notification is required. Patriot made a good faith effort to identify RACM throughout the building. The asbestos inspection did not include identification of materials which may be concealed, such as between walls or buried. If suspect RACM not identified in this report are encountered during demolition activities, Patriot should be contacted for inspection and possible sampling for laboratory analysis. QUALIFICATIONS OF ASSESSMENT Our professional services have been performed, our findings obtained and our recommendations prepared in accordance with customary principles and practices in the fields of environmental science and engineering. 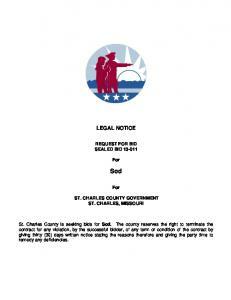 This warranty is in lieu of all other warranties either expressed or implied. This company is not responsible for the independent conclusions, opinions or recommendations made by others based on the field exploration and information research presented in this report. 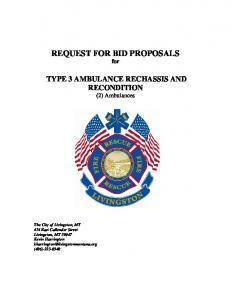 In addition, this report is intended for the sole use of the Perrysburg Township. 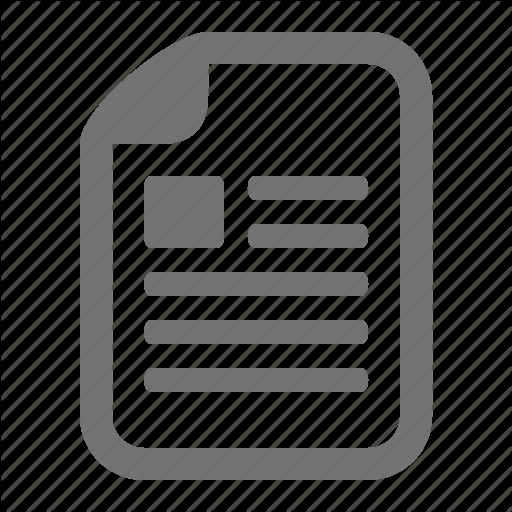 Any use or re-use of this document or the findings, conclusions, or recommendations presented herein are at the sole risk of said user. We trust that this submittal is responsive to your needs. Please do not hesitate to contact us if you should have any questions or require additional information regarding the contents of this report. Sincerely, Patriot Engineering and Environmental, Inc. THIS IS THE LAST PAGE OF THE REPORT. 1) View of on-Site building. 2) View of on-Site utility shed. 3) View of interior of utility shed. No suspect asbestos containing material was noted inside the shed. 4) View of 9” x 9” asbestos containing floor tiles in hallway. 5) View of non-asbestos containing ceiling texture in restroom. 6) View of asbestos containing window glazing. 7) View of damaged, asbestos containing thermal system insulation on pipes in crawl space 1 in basement. 8) View of damaged, asbestos containing thermal system insulation on pipes in basement chiller room. 9) View of asbestos containing thermal system insulation in basement boiler room. 10) View of non-asbestos containing pipe cloth over fiberglass insulated piping located in basement boiler room. 11) View of asbestos containing thermal system insulation in basement boiler room showing air cell on the far right vertical pipe. 12) View of damaged, asbestos containing thermal system insulation and debris in crawl space 2 in basement. 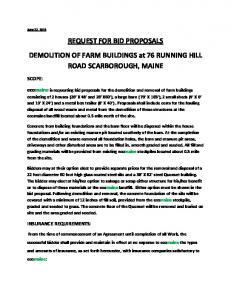 Request For Proposals (RFP) Building Demolition P57-400-100000014000, 15000, 16000, 17000, 18000 Lime City Road (.1 miles North of Route 20) (41.536758, -83.568213) Perrysburg Township is seeking proposals for the demolition of the structure on the aforementioned property; the structure was once the site of Lime City School. Structure may be physically inspected on May 21, 2013 between 9:00 a.m. and 3:00 p.m.
Report "Total Bid for asbestos abatement ONLY $ Total Bid for building demolition* ONLY $ Total Bid for asbestos abatement AND building demolition* $"